You think the International Space Station is impressive? You know nothing. To be fair, the ISS is the quintessential human space outpost – an orbiting icon of diplomacy, scientific progress and technological achievement. (It also gets major points for, you know, actually existing in real life.) But for as impressive as the ISS is, it is but a pale shadow of the city-sized space colonies conceived of by NASA scientists in the summer of 1975. Artificial gravity. Trees. Interstellar sunsets. Bustling suburban infrastructure. Sprawling fields of produce. HANG GLIDING. These scientifically informed artistic renderings have it all. 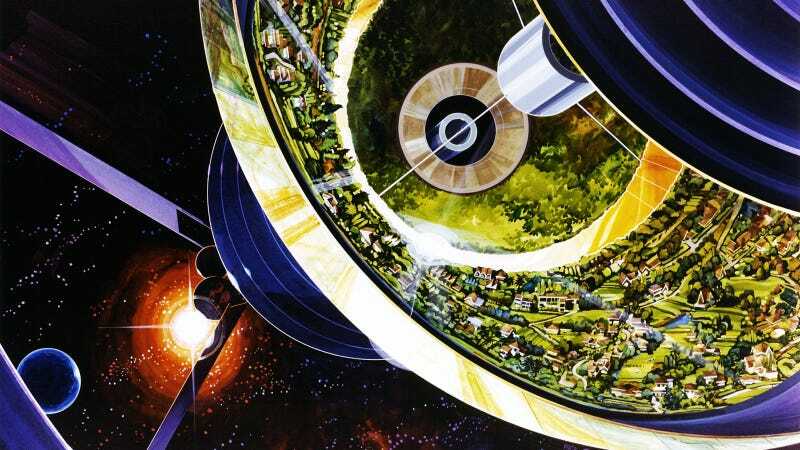 Designed for populations ranging from 10,000 to one million, these deep-space settlement concepts are the result of three "space colony summer studies" conducted by researchers with NASA's Ames Research Center in 1975 at Stanford University, and they are utterly superb. NASA and jawdropping vintage concept art go together like rocket fuel and oxidizer. For more, check out these mock-ups from the Shuttle Program's early days.